If I do not use the entire can of refrigerant, can I leave the gauge attached for future use? It is possible that you will completely recharge your system without using the full can of refrigerant. In this case, after disconnecting from the port, simply leave the gauge and hose assembly connected to the can, and store it in a cool, dry location for later use. Why should I use a “High Mileage” refrigerant? A High Mileage refrigerant contains a proprietary formulation of lubricant enhancers that helps your old compressor run easier. This will help make the compressor last longer and run quieter. It contains special anti-wear and lubricant additives to restore an older A/C system's performance. What is ICE 32® and how does it work? ICE 32® is a performance enhancer that is added to some of our lubricants and oil charges. It reduces friction, which cuts down wear on metal parts and seals – extending compressor life. It helps to keep the compressor clean, and prevents oxidation and acid formation. It also cuts humidity – meaning it keeps air drier to help improve cabin comfort. Can you mix R-12 and R-134a refrigerants? No. You cannot mix R-12 and R-134a. If you have an R-12 system that you would like to repair, you will need to use our retrofit kit to make it compatible with R-134a refrigerant. Retrofitting a system is much easier than you think, and we have detailed instructions and a video to guide you through the process. If you are still not sure and would like more information about retrofitting your system, call our customer support line at 888-318-5454. No. Your car’s A/C refrigerant never goes bad. Nor do you “use up” the refrigerant that is in your system. 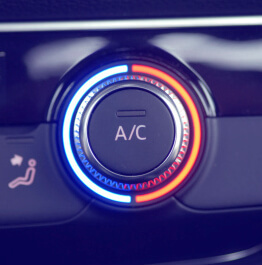 If your vehicle’s A/C system pressure is low, your vehicle has a refrigerant leak and that leak will need to be repaired in order for your system to hold refrigerant. If your vehicle is able to maintain a charge for a period of two weeks or longer, then it is possible to seal the leak with sealant such as Super Seal. If your system will not hold a charge for at least a two-week period, then it is advisable to seek professional assistance to find and repair the leak. My A/C is blowing cold, but not as cold as I would like it to. Will adding additional refrigerant make the air colder? The answer here is twofold. It is possible that the system has a small leak, and now is low on refrigerant. This will allow the system to blow cold, but just not as cold as it has before. In this case, check the low-side pressure and verify if the system is low on refrigerant. If it is low on refrigerant, add refrigerant or a refrigerant with a Stop Leak to the correct pressure. If your pressure is correct, adding additional refrigerant will not make the system blow out colder air, but will, in fact, cause the system to become overcharged. This causes the system to work less efficiently and will result in warmer air blowing from the vents. We recommend using a pressure gauge to determine an accurate fill. Without knowing what your system’s pressure is, you could easily overcharge the system, causing warm air to blow from the vents and causing damage to your A/C system. Our color-coded pressure gauges indicate whether you should continue filling (charging) or not, making the recharge process an easy one.